ExplainingTheFuture.com is a free online resource for anybody interested in the future! If you are a journalist seeking an input to a future studies media item or want to commission an article, then please contact me. Giuliano Aluffi “Case, auto, cuori così stamperemo il futuro”, La Repubblica, 9th January 2019. This is an article on 3D printing in one of Italy’s national newspapers, in which I am interviewed. The title translates as “Houses, cars, hearts: this is how we will print the future”. YouTube The UK Book of YouTube 2018 (November). This book includes Christopher Barnatt as one of those content creators "redefining the future of video content". IGD ""We’re going to have to learn to be a lot more efficient with resources", review of my closing keynote at the Leading Edge Annual Conference. 2 October 2018. Christopher Barnatt "Futurist Christopher Barnatt's review: 3D Printing Innovations at the TCT Show 2018" 3Ders.org, 2nd October 2018. Christopher Barnatt "Replaced by the Robot? ", The Linguist, 57/4, August/September 2018. Alex Bate "10 YouTubers You Should be Following", Raspberry Pi Foundation, 8 August 2018. BBC Radio Nottingham interview with Frances Finn on "Electric Cars", 4th November 2017. Christopher Barnatt "Futurist Christopher Barnatt's review: 3D Printing Innovations at the TCT Show 2017" 3Ders.org, 2nd October 2017. BBC 2 "The 21st Century Race for Space" (Brian Cox documentary produced by Sundog pictures, for which I supplied asteroid mining CG animation). First broadcast 2th September 2017 at 9:00pm. BBC Radio Nottingham interview with Mark Dennison on "Looking Ahead After 20 Years of Online Banking", 30th May 2017. Gillian Hunter "A World of Opportunity in AI and Machine Learning" LATi, 4th May 2017. BBC Radio Nottingham interview with Frances Finn on "Things that May Disappear in the Future", 22nd April 2017. Jason King "Book Review: 3D Printing 3rd Edition – Christopher Barnatt" 3D Print Headquarters, 16th January 2017. "Wire and Loop Game with Raspberry Pi and Python" The MagPi Magazine, 3rd January 2017. 3Faktur Für 3D-Druck Enthusiasten: Unsere Buchempfehlung für Weihnachten, 8th December 2016. 3Ders.org Interview with Futurist Christopher Barnatt on his Book '3D Printing: Third Edition', 3Ders.org, 28th November 2016. Christopher Isak Single Board Computer “LattePanda” runs Windows 10 [Video], Techacute.com, 24th Novemner 2016. Christopher Barnatt Futurist Christopher Barnatt's Review: The TCT Show 2016, 3Ders.org, 3rd October 2016. Gemma Morgan-Jones "Expecting the Unexpected with Chris Barnatt", Ingenuity News, 28th September 2016. Christopher Barnatt, Ken Starkey and Sue Tempest "Remember Icarus! Seven Risks that Threaten Business Schools", Journal of Future Studies, Volume 21, No.1, September 2017. BBC Radio Nottingham interview with Verity Cowley on "Future Jobs", 9th August 2016. Christopher Barnatt 3D Printing: The Next Industrial Revolution?, North Wales Economic Ambition Board. 8th August 2016. Dark Matter Digital Network interview Heather Wade on her show Midnight in the Desert, discussing "The Next Big Thing". 12th May 2016. BBC Radio Nottingham interview with Mark Dennison on "The Future of Passports", 7th April 2016. Rob Davies Quiz: The 2030 Workplace, HRVille, 4th March 2016. Rob Davies Asteroid Mining Could Be Space’s New Frontier: The Problem Is Doing It Legally, The Guardian, 6th February 2016. Plusnet Community Slides, Robots and Hammocks: Room by Room Breakdown of the Office of the Future, 18th January 2016. BBC Radio Nottingham interview with Frances Finn on "The World in 2026", 2nd January 2016. Christopher Barnatt Christopher Barnatt's Top 10 3D Prints of TCT Show 2015, 3Ders.org, 12th October 2015. Christopher Barnatt Futurist Christopher Barnatt's review: The TCT Show 2015, 3Ders.org, 5th October 2015. Katherine Roberts "The Future of Publishing" Do Authors Dream of Electric Books? 21st September 2015. Jon Pritchard "How to Turn Your Phone into a 3D Hologram" Nottingham Post 5th August 2015. Mary-Ann Russon "Organovo CEO: 3D Bioprinting Organs Will Help Us Get People Off Transplant Waiting Lists", International Business Times 3rd July 2015. Features my bioprinter concept image. Christopher Barnatt "The Rise of Local Digital Manufacturing", TCT Magazine June 2015. Note that the link here is to a reprodution of this article on the TCT Blog. Ibrahim T. Ozbolat "Bioprinting Scale-up Tissue and Organ Constructs for Transplantation", Trends in Biotechnology, Vol.33, No.7 (July 2015). Features my face printer concept image. BBC Radio Nottingham interview with Andy Whittaker on "The Future of Keys", 6th June 2015. Christopher Barnatt "The London 2015 3D Printshow", 3Ders.org 25th May 2015. Kieron Monks "Biotech Startup Creates Rhino Horns - Without Rhinos", CNN 21st May 2015. Rachel Park "Book Review -- 3D Printing: Second Edition", Disruptive Magazine 19th May 2015. BBC Radio Nottingham interview with Mark Dennison on "Future Food", 22nd April 2015. Rey Brown What Comes After The Internet (3D Printing). SmartPhones Made Easy, Podcast 32. 19th January 2015. Jonny Williamson Another giant leap for the UK space sector. 12th January 2015. The Cult of Nick Podcast 136 - Ian McFadyen and Futurist Christopher Barnatt. 7th January 2015. BBC Radio Nottingham interview with Mark Dennison on "Technologies for 2015", 7th January 2015. BNN Back to the Future - Tech disruptors in 2015, live interview on Canadian TV. 31st December 2014..
Jason King Book Review: 3D Printing 2nd Edition – Christopher Barnatt, 3DPrintHG.com, 14th December 2014. BBC Radio Nottingham interview with Mark Dennison on "Artificial Intelligence", 10th December 2014. DRUPA Medical 3D Printing is Likely to be a Billion Dollar Industry, DRUPA Newsroom, 13th November 2014. Ollie Carpenter 3D Printing Could Alter Trading, but How will it Affect Exchange Rates?, Future Currency Forecast, 13th November 2014. Gary Anderson Interview with Christopher Barnatt, 3DPrintingStocks.com, 12th November 2014. 3Ders.org Interview with futurist Christopher Barnatt on his book '3D Printing: Second Edition', 3Ders.org, 9th November 2014. BNN Hewlett-Packard Makes a Bet on the 3D Printing Boom, live interview on Canadian TV. 29th October 2014. BBC Radio Nottingham interview with Sarah Julian on "Drones", 22nd October 2014. Christopher Barnatt Futurist Christopher Barnatt's report: The TCT Show 2014, 3Ders.org, 7th October 2014. Faith Robinson Explore 3DPS With Chris Barnatt, 3D Printshow, 29th September 2014. Sue Burnip Explaining the Future feature 3T at 3D Printshow, 3T RPD, 18th September 2014. Christopher Barnatt Futurist Christopher Barnatt's report: The London 2014 3D Printshow (w/videos), 3Ders.org, 15th September 2014. Christopher Barnatt Rather than desecrate the Arctic should business mine the moon?, The Guardian, 27th August 2014. Gary Anderson Graphene Materials for 3D Printing: This Company is Leading the Charge, 20th August 2014. Jason Hartman Podcast The Future of 3D Printing with Christopher Barnatt, 18th August 2014. BBC World News TV "China Plans to Mine the Moon" Impact, 7th August 2014. Interviewed by Karin Giannone, with footage included from my Mining the Moon video. BBC News Asia "Chinese Moon Mining is 'Possible,' says Futurist", 5th August 2014. here. Ellie Zolfagharifard "Could the Moon Fuel Earth for 10,000 years? ", The Daily Mail, 5th August 2014 (contains images from my Mining the Moon video). BBC Radio 5 Live interview "Drive" show on "China Mining Helium-3 on the Moon", 5th August 2014. Clip here. Marcus Leroux and Hannah Devlin, "China Sets Sights on Mission to Mine the Moon", The Times 5th August 2014. Article contains interview and graphics from my Mining the Moon video. Bryan Borzykowski Another dimension, PWC Up Front, 14th July 2014. BBC Radio Nottingham interview with Sarah Julian on "The Future of Food", 4th July 2014. Laura Crossley, "Interview with Christopher Barnatt", Museological Review, Issue 18, June 2014, pages 5-7. Full issue available as a pdf here. Chaucer Direct Car Safety - A Future Timeline, The Safe Drivers Community, June 2014. BBC Radio Nottingham interview with Mark Dennison on "Resources from Space", 22nd May 2014 -- for more see here. "3D Printshow London 2013", feature on ZIP! Japanese TV show using my video, 11th May 2014. BBC Radio Nottingham interview with Andy Whittaker about "Heartbleed Bug and Online Security", 11th April 2014. Henri Pearson Ask the Experts: Just how close is the Internet of Everything?, Purple WiFi 30th April 2014. Clore Leadership Christopher Barnatt on Sustainability and the Cultural Sector, 28th April 2014. Jason King Book Review: 3D Printing – The Next Industrial Revolution, 27th April 2014. CIR Magazine Information security hits home with Heartbleed, 10th April 2014. Christopher Barnatt Fixing for Sustainability, Business Green 28th March 2014. Gerald Haig The World of 3D Printing, SecEd 13th March 2014. ABC Studio's "Grey's Anatomy" TV Show, Season 10, Episode 16 "We've Gotta Get Out of this Place", first US TX 20th March 2014, includes one of my bioprinting visualizations. Gerald Haigh The World of 3D Printing, SecEd, 13th March 2014, refers to my 3D Printing book. BBC Radio Nottingham interview with Mark Dennison on "Flirting Robots", 6th March 2014. Nicole Ross The Evolution of 3D Printing, Heaven Has Heels February 2014 Edition. Gary Anderson Meet a 3D Printing Stock With a PE of 40: MGI Digital Graphic Technology (FRIIF), 3DPrintingStocks.com 18th February 2014. BBC Radio Nottingham interview with Mark Dennison on "Google Computers Everywhere! ", 17th December 2013. Cube is #1 in Personal 3D Printers lineup of 2013 by Christopher Barnatt, Cubify 16th December 2013. Top 10 Personal 3D Printers of 2013 by Christopher Barnatt, 3DPrintingIndustry.com 15th December 2013. Christopher Barnatt's Video Series: 3D Printshow London 2013 Extra, 3DPrintingIndustry.com 24th November 2013. Mark Hattersley Heart Transplants Using 3D Printed Organs Within 10 Years?, MSN Innovation 12th December 2013. 3Ders.org 3D Printshow in London Highlights Desktop 3D Printers, 3Ders.org, 16th November 2013. A video report of 3D Printshow London 2013, 3DPrintingIndustry.com 11th November 2013. Christopher Barnatt A video report of 3D Printshow London 2013, 3Dprinter.net, 11th November 2013. Top 3d Printing Innovators 2013 from NYC to Paris and Hong Kong,, Sparkah, 7th November 2013. Christopher Barnatt Is sustainability a dangerous myth fuelling over consumption?, The Guardian, 28th October 2013. Gary Anderson The 3D Printing Industry 2013 Video by Christopher Barnatt, 3DPrintingStocks.com, 27th October 2013. Christopher Barnatt Augmenting Reality: Google Glass and the Future of Business, Management Issues, 14th October 2013. 3D Printing Business Opportunities by Christopher Barnatt, 3DPrintingIndustry.com, 13th October 2013. 33rd Square 3D Printing Hits Its Stride, 8th October 2013. Kelly Cookson 3D Printing: The Next Industrial Revolution, Ingenuity Business Network 3rd October 2013. BBC Radio Nottingham interview with Mark Dennison on "Smart Watches", 18th September 2013. Morgan Stanley Research "MedTech: 3D Printing - A Solution for Innovation", Bluepaper, 5th September 2013. Contains bioprinting visualizations. Christopher Barnatt "3D Printing: The Next Revolution? ", RotoWorld, (hardcopy, online minus images) August-September 2013. Gary Anderson Christopher Barnatt on 3D Printing Technologies For High Grade Metals, Engineering.com, 28th August 2013. Christopher Barnatt Can 3D Printing Change the World, GM Opinion, 23rd August 2013. BBC Radio Oxford interview with Phil Gayle about "Future of Money", 21st August 2013. BBC Radio Nottingham interview with Frances Finn on "Bit Coin", 1st August 2013. Kinzy Janssen The Next Big Business Boom: 3-D Printing, Staffing Talk, 25th July 2013. Amanda Richter 4 Ways Nanotechnology Will Revolutionize Medicine, Nanotechnology Now, 17th July 2013. Gary Anderson Welcome to the NYSE Organovo Holdings!, 3DPrintingStocks.com, 11th July 2013. Christopher Barnatt A Quantum Interview with Professor Christopher Barnatt, Progressive Voices, 1st July 2013. BBC Radio Nottingham interview with Mark Dennison about "3D Printing", 26th June 2013. Christopher Barnatt Dematerialising the Future: What Role Can Technology and Consumers Play?, The Guardian, 5th June 2013. Christopher Barnatt Direct Digital Manufacturing Pioneers, Replicator World, June 2013. Christopher Barnatt "Bioprinting", Long Life Magazine, Volume 45, Number 2. Rachel Park iMakr – Peak Inside The 3D Printer Store, 3Dprintingindustry.com, 18th May 2013. Christopher Barnatt Report from iMakr, the World’s Largest 3D Printer Store, 3Dprinter.net, 17th May 2013. Interview with the ICAEW Business Advice Service Growth Isn’t Everything – Running a Stable Business Is, 10th May 2013. National Public Radio (NPR) interview with Jacki Lydon about Big Data When Digital Dust Is Gathered, Constellation May Be Muddled, 13th April 2013. Phil Taylor "Future imperfect: How breakthrough technology can support healthcare", PMLive.com 4th April 2013. BBC Radio Nottingham interview with Andy Whittaker about "Smartphones and Online Ticketing", 22nd March 2013. BBC Radio Coventry and Warwickshire interview with Annie Othen about "4G v Freeview", 13th March 2013. BBC Radio Merseyside interview with Simon Hoban about "4G v Freeview", 7th March 2013. BBC Radio Nottingham interview with Mark Dennison about "4G v Freeview", 7th March 2013. María Fernanda Navarro "Sólo dé “imprimir” y su deseo se hará realidad", Excelsior, 24th February 2013. Steve Holt "Hungry for Dinner? Just Hit 'Print", Take Part, 15th February 2013. Rick Docksaki "Building a Better Future, One Molecule, Gene, or Quantum Bit at a Time, The Futurist, March-April 2013. (Review of 25 Things You Need to Know About the Future. Michael Bradbury "State of the Union: Printing the Future with Science and Innovation", Real Science, 13th February 2013. Gracie Chen "Entrepreneurs try to popularize 3D printing", Marketplace, 8th February 2013. Christopher Barnatt Cloud Computing 2013 and Beyond, FreshBusinessThinking.com, 22nd January 2013. Ibrahim Tarik Ozbolat and Howard Chen, H. "Manufacturing Living Things", Industrial Engineer, Vol.45, No.1 (January 2013). Features a custom bioprinter concept image. BBC Radio Oxford interview with Nick Piercey about "Seven Ways to Fix the World" -- and lots of other things!, 31st December 2012. BBC Radio Nottingham interview with Mark Dennison about "Seven Ways to Fix the World", 12th December 2012. BBC Radio Oxford interview on "Artificial Intelligence", 8th December 2012. Christopher Barnatt The Death of Economics?, Management-Issues, 28th November 2012. Christopher Barnatt Can 3D Printing Change the World?, Replicator World, 26th November 2012. Will Dean "Does 3D printing mark the advent of a 'new industrial revolution'?" Belfast Telegraph, 25th October 2012 (contains embed of my 3D Printshow video). 3D Printshow London 2012 video report by futurist Christopher Barnatt, article on 3DPrinter.net, 22nd October 2012. Talk Radio Europe interview on Behind the Mike with Kenny Jones about "Seven Ways to Fix the World", 15th October 2012. Ibrahim Tarik Ozbolat, "Artificial Organ Fabrication: Towards 3D Organ Printing," Science and Technic Magazine; Issue 539, October 2012. Features my bioprinter concept image. BBC Radio Nottingham interview with Mark Dennison on "James Bond Gadgets", 1st October 2012. Explaining the Future | Singularity or decline?, Kurzweilai.net, 28th September 2012. "How 3D Printing Could Save HP" by Dana Blankenhorn, The Street, 27th September 2012. "Extending and enhancing life through bioprinting" by Chris Waldo, 3DPrinter.net, 25th September 2012. BBC Radio Nottingham interview with Mark Dennison on "The Benefits of Space Exploration", 6th September 2012. Sky News special documentary "Born Bankrupt", TV interview with Jeff Randall, 24th August 2012. "The Revolution with be 3D Printed" article by Stephen Graves in Stuff magazine, August 2012. Features my bioprinter illustration. BBC Radio Nottingham interview with Frances Finn on "Future Jobs", 17th July 2012. BBC Radio Nottingham interview with Mark Dennison on "The Future of Shopping", 3rd July 2012. The risks and rewards of cloud computing, The Daily Telegraph, 29th June 2012. Technology as The Gateway to Paradise? (video), talk delivered as part of the Greenbelt Paradise Lost and Found event, 20th May 2012. Christopher Barnatt's online 3D printing experiment with i.Materialise, 3ders.org, 28th April 2012. Online 3D printing with i.Materialise, article on 3DPrinter.net, 27th April 2012. "The Good Prof is Very Clear on the Future", review of my book 25 Things You Need to Know About the Future by John Ruszczyk in the Manly Daily, Australia, 13th April 2012. Interviewed by Rhodri Marsden in his "Get Connected" article for Business Traveller, 9th April 2012. The 3D Printing Revolution of Customized, Personal Manufacturing, article on 3DPrinter.net, 6th April 2012. Starre Vartan Sustainable Cities of the Future, Mother Nature Network, 27th March 2012. Organovo: The Bioprinting Pioneer to Watch, article on 3DPrinter.net, 26th March 2012. 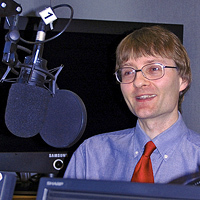 Talk Radio Europe interview with Steve Gilmour on 25 Things You Need to Know About the Future, 2nd March 2012. BBC Radio Sheffield interview with Rony Robinson on "Future (payment) Technologies", 16th February 2012. BBC Radio Nottingham interview with Frances Finn on "The Future of Food", 15th February 2012. "Future Gazing: All You Need to Know About the Future", article and interview by Imogen O'Rorke on my book "25 Things You Need to Know About the Future" Your Choice (NHS Magazine) Spring 2012 (published 6th February). Radio 101 Zagreg, Croatia interview with Danja Dubravac on "3D Printing", 6th February 2012. BBC Radio Guernsey interview with Jenny Kendall-Tobias on 25 Things You Need to Know About the Future, 27th January 2012 (yes I went back for a second one three days later the one on Jan 24th!). Little Atoms Radio Show interview with Neil Denny on Resonance FM about 25 Things You Need to Know About the Future, 27th January 2012 -- listen here. BBC Radio Guernsey interview with Jenny Kendall-Tobias on 25 Things You Need to Know About the Future, 24th January 2012. BBC Radio York interview with Jonathan Cowap on 25 Things You Need to Know About the Future, recorded 24th January 2012. BBC Radio Manchester interview on 25 Things You Need to Know About the Future, recorded 24th January 2012. BBC Radio Sheffield interview with Rony Robinson on 25 Things You Need to Know About the Future, 24th January 2012. BBC Radio Jersey interview with Carrie and Sarah on 25 Things You Need to Know About the Future, 24th January 2012. BBC Radio Gloucestershire interview with Faye Hatcher on 25 Things You Need to Know About the Future, 24th January 2012. BBC Radio Newcastle interview with Jonathan Miles on 25 Things You Need to Know About the Future, 24th January 2012. BBC Radio Stoke interview with Stuart George on 25 Things You Need to Know About the Future, 24th January 2012. BBC Radio Scotland interview with Fred MacAulay on 25 Things You Need to Know About the Future, 24th January 2012. BBC Radio Oxford interview with Malcome Boyden on 25 Things You Need to Know About the Future, 24th January 2012. BBC Radio Bristol interview with John Darvall on 25 Things You Need to Know About the Future, 24th January 2012. BBC Radio Leicester interview with Jim Davis on 25 Things You Need to Know About the Future, 24th January 2012. BBC Radio Shropshire interview on "Colin Young's Lunchbox" about25 Things You Need to Know About the Future, 24th January 2012. BBC Radio Hereford and Worcester interview with Tony Fisher on 25 Things You Need to Know About the Future, 24th January 2012. BBC Radio Merseyside interview with Sean Styles on 25 Things You Need to Know About the Future, 24th January 2012. BBC Radio Norfolk interview on 25 Things You Need to Know About the Future, recorded 24th January 2012. Look to the Future, review of my book "25 Things You Need to Know About the Future", New Scientist, 21st January 2012. Internet Evolution Radio interview with Mary Jander, 19th January 2012. "Life in the Future" interview on the BBC Radio Nottingham Morning Show, 19th January 2012. Printed Life, Mechanical Engineering article by Jean Thilmany, January 2012. Features my bioprinter concept and a quote. What We're Reading The New York Times -- Diner's Journal, 6th January 2012 -- discussion of my Epicurious interview on the future of food. A Futurist Talks Food Epicurious interview with Megan O. Steintrager, 5th January 2012. "About the Future", e-Learning Age, December/January 2012 -- Richard Naish discusses my book 25 Things You Need to Know About the Future. Review of The Legacy: An Elder's Vision for a Sustainable Future in CIR Magazine, November 2011. "Gadgets in 10 Years Time" interview on the BBC Radio Nottingham Morning Show, 18th November 2011. Bioprinting: Organ Transplants Becoming A Thing Of The Past? ABC 25 WPBF TV News Report, 7th November 2011. Hybrid Hosting Adds to Cloud Options InternetEvolution, 7th November 2011. "Cloud Computing: Still the Best Kept Secret?" In Business (Derbyshire and Nottinghamshire Chamber of Commerce Magazine), July-August 2011. Can we speak the new language of the cloud? Cloud Pro, 2nd June 2011. SME's to Embrace Cloud Computing? InfoGrokTechnology, 22nd December 2010. Head in the clouds The Manufacturer, November 2010. "Looking Good in the Future" interview on the BBC Radio Nottingham Morning Show with Frances Finn, 24th November 2010. A Nip in the Air? (cloud computing article written with Deborah Ritchie), CIR Magazine, October 2010. Human resources: Sophisticated software is less in use for more strategic roles Financial Times, 9th November 2010. "Things That Never Were" interview on the BBC Radio Nottingham Morning Show with Frances Finn, 14th October 2010. The cloud-shaped future of life online, review of A Brief Guide to Cloud Computing by New Scientist, 1st September 2010. "Cloud Computing and Mobile Phones" interview on the BBC Radio Nottingham Morning Show with Frances Finn, 26th August 2010. IT Conversion Leaves Bosses on Cloud Nine The Financial Mail Women's Forum, 15th August 2010. IT Conversion Leaves Bosses on Cloud Nine ThisIsMoney.co.uk, 14th August 2010. Cloudy Outlook Attracts Nimble Companies and Developers CWjobs.co.uk, 12th August 2010. An Engineer in Wonderland - Build a 20W PC ElectronicsWeekly.com, 11th August 2010. Building a Green PC Mini-itx.com News, 6th August 2010. "Future Cities" interview on the BBC Radio Nottingham Morning Show with Frances Finn, 4th August 2010. "Life Extension" interview on the BBC Radio Nottingham Morning Show with Frances Finn, 15th July 2010. IBM business clinic: How can... the cloud improve collaboration and make my business more efficient? (contribution) Director Magazine, July/August 2010. "Future Weather" interview on the BBC Radio Nottingham Morning Show with Frances Finn, 19th January 2010. Web 3.0 Promises Much to CIOs CIO Magazine, 11th January 2010. "Future Energy" interview on the BBC Radio Nottingham Morning Show with Frances Finn, 15th December 2009. "Online Identity Theft" interview on BBC Radio Nottingham's Breakfast Show with Andy Whittaker, 14th October 2009. Moving Beyond Web 2.0, Computing, 13th October 2009. "Future Entertainment" interview on the BBC Radio Nottingham Morning Show with Frances Finn, 9th October 2009. Tomorrow's World (Cloud Computing), The Midlands Magazine, 1st October 2009. "The Future Home" interview on the BBC Radio Nottingham Morning Show with Frances Finn, 17th September 2009. "The World in 50 Years", interview on City Talk Radio's Beyond the Dark with Roy Basnett, 18th August 2009. "Anniversary of Moonlandings" interview on the BBC Radio Nottingham Morning Show with Frances Finn, 20th June 2009. "The Future A-Z: X to Z" interview on the BBC Radio Nottingham Morning Show with Frances Finn, 9th June 2009. "Internet Privacy" interview on BBC Radio Nottingham's Breakfast Show with Andy Whittaker, 7th July 2009. "The Future A-Z: U to W" interview on the BBC Radio Nottingham Morning Show with Frances Finn, 2nd July 2009. "The Future A-Z: Q to T" interview on the BBC Radio Nottingham Morning Show with Frances Finn, 25th June 2009. "Life Extension" interview on Kerrang! Radio's The Night Before with Nick Margerrison, 18th June 2009. "The Future A-Z: N to P" interview on the BBC Radio Nottingham Morning Show with Frances Finn, 12th June 2009. "The Future A-Z: J to M" interview on the BBC Radio Nottingham Morning Show with Frances Finn, 4th June 2009. "The Future A-Z: H to I" interview on the BBC Radio Nottingham Morning Show with Frances Finn, 28th May 2009. "The Future A-Z: D to G" interview on the BBC Radio Nottingham Morning Show with Frances Finn, 20th May 2009. "The Future A-Z: A to C" interview on the BBC Radio Nottingham Morning Show with Frances Finn, 14th May 2009. "Flu Pandemic and Mining Helium-3 on the Moon" interview on the BBC Radio Nottingham Morning Show with Frances Finn, 28th April 2009. "The Next Global Catastrophe" interview on Kerrang! Radio's The Night Before with Nick Margerrison, 27th April 2009. "Future Studies" interview on the BBC Radio Nottingham Morning Show with Sarah Julian, 23rd April 2009. Why Life Is Tweet For Those Who've Made The (high-speed) Connection, Derbyshire Telegraph, 27th April 2009. "The New Industrial Convergence" interview on Kerrang! Radio's The Night Before with Nick Margerrison, 25th February 2009. "Future Gazing as Future Shaping", interview on City Talk Radio's Beyond the Dark with Roy Basnett, 6th February 2009. "Mining Helium-3 on the Moon", interview on City Talk Radio's Beyond the Dark with Roy Basnett, 16th January 2009. "Ubiquitous Computing" interview on Kerrang! Radio's The Night Before with Nick Margerrison, 12th January 2009. "Thinking Machines" interview on Kerrang! Radio's The Night Before with Nick Margerrison, 15th October 2008. "Mining Helium-3 on the Moon" interview on Kerrang! Radio's The Night Before with Nick Margerrison, 12th August 2008. "3D Printing" interview on Kerrang! Radio's The Night Before with Nick Margerrison, 30th June 2008. YouTube Fridays: Bill Gates Lookalike Explains Cloud Computing IT World Canada, 30th May 2008. "The Transhman Agenda" interview on Kerrang! Radio's The Night Before with Nick Margerrison, 28th May 2008. "Internet Censorship" interview on Kerrang! Radio's The Night Before with Nick Margerrison, 30th April 2008. Pakistan Accidentally Blocks YouTube in UK While Censoring 'blasphemous' Anti-Islam Videos, Daily Mail, 26th February 2008. Viewers Turn Off TVs to Surf the Web, Daily Telegraph, 8th June 2007. This page last updated 27 January 2019. Please visit our sister site at ExplainingComputers.com.